An old community rich with history, Golden Hill reflects the classic dichotomy of a neighborhood that's up and coming. 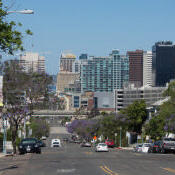 Just a stone's throw from downtown San Diego, it boasts stately mansions of yesteryear along with large, modern apartment complexes, posh condos, Craftsman and Spanish-style homes, funky little structures tucked into nooks and crannies, and everything in between. Call it urban historic. Golden Hill sprang to life back in 1870, when development began on its western end with those terrific views, and was almost completely built out by the 1920s. San Diego politicians and the many of city's elite had homes here. The community’s 9,000 residents enjoy easy access to downtown and public transportation, but they can also get on any number of freeways -- SR-94 and 163, Interstates 5, 805 and 15 -- in a matter of minutes. The median annual household income is $43,036.